A tasty classic, full of flavor. Rinse turkey and pat until completely dry with paper towels. Sprinkle 1 tablespoon salt inside turkey cavity. Set in roasting pan with rack. Reserve. In a food processor, combine butter, herbs, 1 bunch parsley, remaining 1 tablespoon salt, pepper and olive oil and blend until combined and the mixture reaches a whipped consistency. Rub butter over the turkey, making sure to get under the skin. Place lemons and remaining 1 bunch parsley inside cavity. Tuck wings under to avoid burning. Add 2 cups turkey stock to bottom of pan. 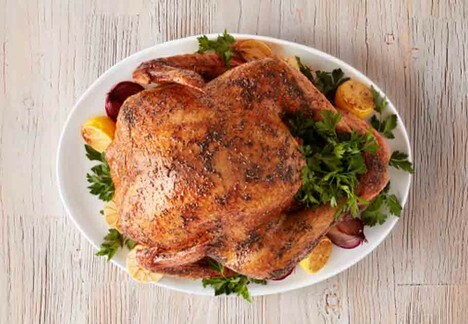 Roast turkey for 3 hours or internal temperature reaches 165°, basting once every hour. Remove turkey and rack from pan and tent with foil. Reserve. Skim excess fat from pan drippings. Discard fat, heat drippings over medium-high heat. Add wine and bring to a boil. In a medium jar, combine remaining 4 cups turkey stock and flour. Seal with lid and shake vigorously to combine. Add to gravy pan and whisk until thickened. Remove from heat and season to taste with salt and pepper. Carve turkey and serve with white wine gravy. TIP: To keep turkey extra moist, brine the turkey by submerging in a mixture of 1 gallon of water, 1 cup sea salt and 1 cup sugar. Add in your favorite herbs and refrigerate for at least 2 days.